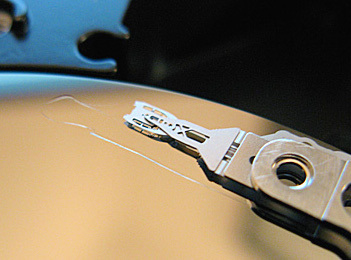 Hard drive’s that have damaged platters are often very difficult for data recovery companies to retrieve the files from. This is because the surface of the hard drive that actually holds the data is damaged and reading it is therefore sometimes not possible. I have a 500GB USB 3.0 WD Elements external drive (see review here), which I’ve been using on a mac. It fell off a table about 1 metre onto a wooden floor, flat-side down. It now won’t mount or be recognised by Disk Utility. It makes a whirring sound for a while and then eventually stops with a high-pitched sound. Does this sound recoverable? If so how much would that cost? 1. platter(bottom layer) have scratch(damage) of SA area and top layer have a little scratch. As you know, severe media damage(scratch) have been impossible to recover data for almost(99%) recovery company. This is why I’m very very despaired.. But, I would like to have a glimmer of hope. So.. prior to comission for your lab, I want to know if the recovery can proceed for your lab of capability. The hard drive is not recognised anymore and beeps when powered on. It stopped working after I closed my laptop lid. There is not a huge amount of data, only handful of documents but I’d like to be able to recover what was saved on the desktop. How much would it cost to access and recover data? —> twice recovery task tried, (physical damage – a little platter scratch ) / Conclusion : recovery Impossible. —> platter layer (top), layer 3(bottom) scratch exist. They(previous recovery engineer) said that bottom layer of SA area have scratch(media damage). So, any technology will be impossible for recovering this media(hdd). But, I heard your lab to make a study about media damage(scratch) and had magnetic force microscopy recovery technology(actully use to employ this a few years ago) . Also, I believe competence and capacity of your lab. All of the data files are education video files(wmv, asf, avi, mp4..), and I want to recover those about 350GB. Because of video files, It will have to be played nomally without error or problem. But, I worry that two of platter’s peculiarity balance was broken because previous recovery lab had took them from the body in order to check scratch/crash of media layer.